Hip Hop Mogul Rick Ross will be hosting, what is being slated as an unforgettable event in the making. The Miami based artist will be joining the night life connoisseurs of Dallas for this high powered evening of music and entertainment. With the levying stature of a goliath and the regal standing of a King, Rick Ross has lived up to his prophecy of being the “Biggest Boss.” The Miami Monster Mogul has evolved into not just hip-hop’s most respected and revered MC, but as a label CEO and business entrepreneur, his resumé is as sterling as one of his platinum plaques. MTV calls his latest project, MASTERMIND one of the most anticipated hip-hop albums of 2014. Dominating the mic and amping the crowd will be MMG cohort and K104’s DJ A Bay Bay, along with 97.9 The Beat’s Dj Kayotik on the 1’ and 2’s. 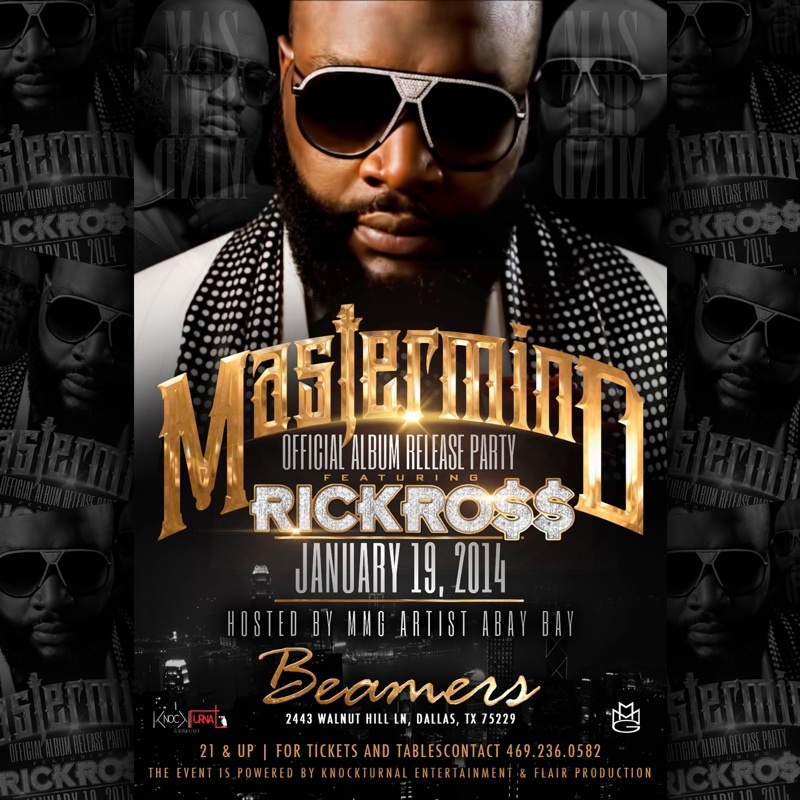 Come out and party this MLK Weekend with the BOSS, Rick Ross on the 1st stop of his “MASTERMIND ALBUM RELEASE” tour January 19th, at Beamers. Special guest from the Maybach Music Group, Dallas Cowboys, Celebrities, The Black Bottle Boys & Black Bottle Girls and more will be in the building. Start your New Year off right with the hottest event in the city powered by Knockturnal Entertainment & Flair Productions.